Have you ever dreamed of living in a French Norman or English Tudor? Yalecrest tempted some of the earliest settlers in Salt Lake City with panoramic views of the Wasatch and Oquirrh Mountains, making it one of the most desirable neighborhoods in the state. Located on Salt Lake City’s coveted East Bench, Yalecrest is contained within a six-block square radius. The boundary runs from 1300 South to Sunnyside Avenue and 1300 East to 1900 East. Yalecrest benefits from mature trees, beautifully landscaped lawns, and the largest concentration of period revival English cottages, Spanish Colonials, French Normans, and English Tudors in Utah. The rare architectural variety is largely thanks to the prominent architects, business executives, scientists, and artists who have called Yalecrest home through the years. Of the 2,090 households within Yalecrest, nearly 1,500 of them were built in the early 20th century. Beauty and proximity to both nature and downtown come with a price. Cost of living is 29 percent higher than the average Salt Lake City neighborhood, with homes priced double the median range. Rentals don’t pop up often, as the majority of residents are homeowners. According to the Zillow Rent Index, the average cost to rent in Yalecrest is $2,318, while the median cost to rent in Salt Lake City is much lower at $1,400. The median home value in Yalecrest is $480,900, double the average Salt Lake City home, which hovers around $243,000. Property values in Yalecrest have increased 7.4 percent over the past year and continue to rise. An average commute time for Yalecrest residents is 18 minutes. Car: Yalecrest is positioned near the I-80 and belt route and can connect you to I-15, placing you anywhere in the city in less than 20 minutes. Walking: Rolling hillsides elevate dramatically, making a walk more exercise than leisure. Public transit: Yalecrest is served for free by the Green and Purple Routes of the University of Utah commuter line on Sunnyside Ave. From here, one may connect to the UTA TRAX Stadium Station. Biking: Currently no bike lanes exist in Yalecrest. However, the streets are quiet and safe for such a commute. While close to all Salt Lake City has to offer, there is no entertainment within walking distance of the neighborhood. Yalecrest provides a quiet escape from the hustle and bustle of downtown. Wake up to Eggs in the City, a local favorite that offers comfort breakfast, brunch, and lunch items in a former gas station. If you’re in the mood to eat your way through a stack of pancakes or just stuff yourself silly, bring a friend, get two or three meals, and share. Proudly serving dishes of the slow food movement variety, Sea Salt Restaurant provides clean, green, locally sourced ingredients to enjoy in full view of an open kitchen or from the patio. A unique interpretation of Italian cuisine, Sea Salt offers fine wines, varying textures, and bittersweet desserts. Sea Salt’s rosemary pine nut cookie is just one surprise awaiting your palate. Harmon’s Emigration Market borders the Yalecrest neighborhood. It’s smaller than the average grocery store, so it may supplement rather than fill all of your grocery needs. It’s relatively expensive, so if you’re on a budget, it’s better to shop elsewhere. Jolley’s is a boutique and floral corner shop with a pharmacy conveniently located inside. Streets in the area are named after Ivy League schools. Quality education begins young, and a blend of public and private schools makes up the educational backbone of the area. The high school graduation rate in Yalecrest is 17 percent higher than Salt Lake City as a whole. Test scores in Yalecrest are equal to the national average, positioning students for college education. Rowland Hall is a rigorous independent school that serves 930 students PK-12. The school incorporates technology into the classroom as young as kindergarten and offers unique programs such as robotics and the only junior ski academy in the state. The school is pricey, but they do offer financial aid to those who qualify. Bonneville Elementary is ranked as one of the top schools in the state. Not only have students scored highest in statewide testing, but Bonneville provides a variety of enrichment programs. Bonneville also offers YMCA’s Project Cornerstone, which focuses on healthy habits, social responsibility, and an anti-bullying curriculum. If you’re already sold on Yalecrest, it’s about to get even better. 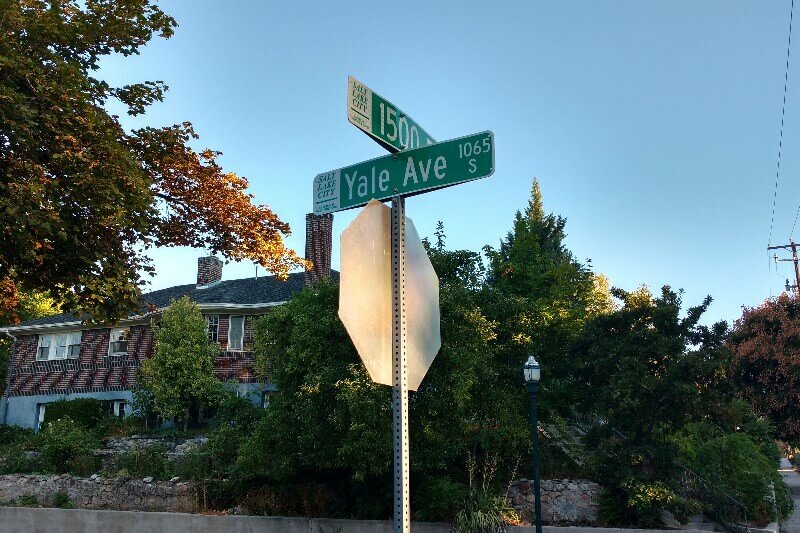 Yalecrest is among the safest areas in Salt Lake City—in fact, according to areavibes, it’s safer than 79 percent of Utah. The Yalecrest Neighborhood Council takes crime seriously and encourages all residents to report suspicious activity such as car prowling. Ready to call Yalecrest home? The next step is simply deciding whether you’re a French Norman or English Tudor type of person.